No show by Dierdre Pearce is like its predecessor, so one has to make sure not to miss any. Dierdre is an ardent traveller and I was getting the feeling as I walked around that her travels might have played a role in this exhibition. You can use you phone camera to read bar codes which bring up pics connected to texts on the wall … pics of far away places. So Dierdre’s versatility might also have something to do with her visits to exotic destinations or the fact that she was once a scientist. The possessor of an inquiring mind. 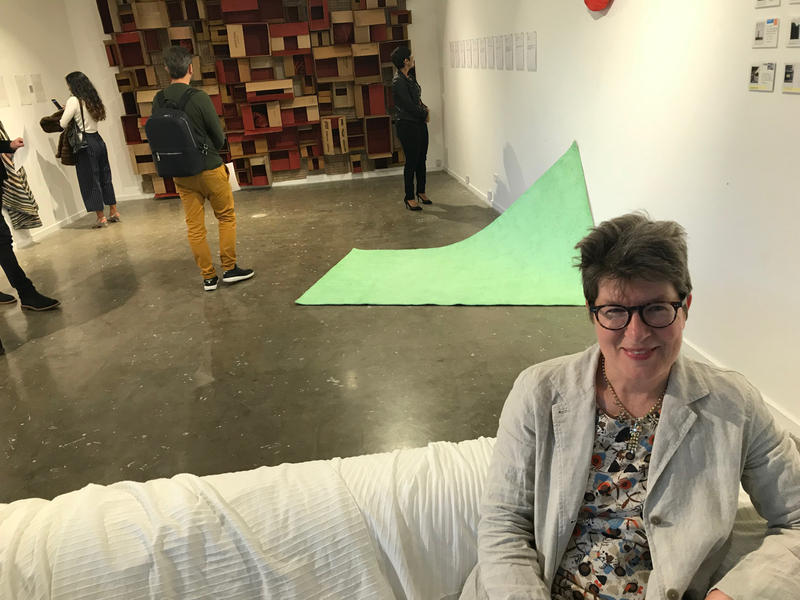 This exhibition Parataxis covers a lot of ground and is about how we, humans, have adjusted to the digital world – or as Dierdre puts it – digital immersion. Its a lot interactive so you can have scary fun working out how human and algorithmic systems start to depend on one another. Thats what Parataxis is all about and there is a nice comfy couch with TV so you can relax and take it all in. Be warned – could need two visits. At CCAS Manuka until Sunday 9 December.